If you’ve ever had a stuffy nose or cough, you’ve probably used over-the-counter remedies with eucalyptus oil in them. Eucalyptus oil is often used in cold and congestion products to help get you through the sniffles, but you may be surprised to know that eucalyptus oil uses don’t stop there. The clean fresh scent and the therapeutic benefits of eucalyptus essential oil can also be applied to your home, laundry, beauty routine and natural skin care. Read on for eucalyptus essential oil recipes plus some fun facts about eucalyptus. There are more than 800 species of eucalyptus plants, the majority of which are native to the Australian continent. (2) However, eucalyptus tree crops have been cultivated all around the world for a variety of uses. Although eucalyptus trees are still cultivated for timber, today eucalyptus oil is highly valued for use in cosmetics, fragrances, and aromatherapy products. (8) The average person can use eucalyptus essential oils for anything from cleaning house to refreshing sweaty feet after a good work-out. The eucalyptus plant has long been associated with purifying the air and living spaces. In nineteenth century England, eucalyptus oil was used to clean certain instruments in hospitals because it was believed to contain antimicrobial properties. (9) This was at a time when the scientific community was just discovering microbes and developing germ theory. Regardless, using eucalyptus essential oil to clean and perfume your home is a great way to add a clean fresh feel to your space. 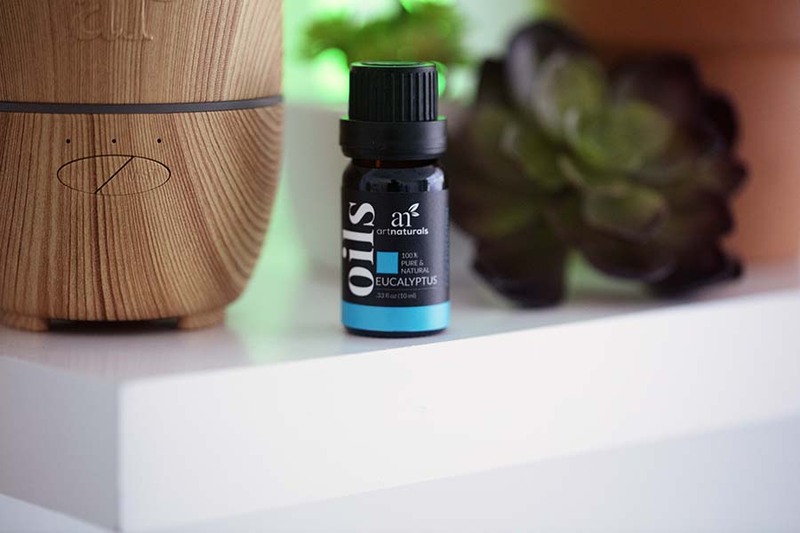 Eucalyptus Essential Oil Diffuser: Adding a few drops of eucalyptus or an essential oil blend with eucalyptus in your oil diffuser is the easiest way to incorporate it into every day use in your home. The aromatherapy benefits of eucalyptus oil include a clean fresh feeling and clearing the mind, which creates an atmosphere that promotes concentration and focus. Use Eucalyptus Oil for Cleaning: A simple vinegar spray is a tried and true for all-purpose cleaning with natural ingredients. Adding eucalyptus essential oil takes your spray to the next level adding a fresh clean scent. To make your own eucalyptus cleaning spray, mix 1 cup of water, 1 cup of distilled white vinegar and 10-20 drops of eucalyptus essential oil in a spray bottle. Give it a swirl and you’re ready to get cleaning. DIY Eucalyptus Static Spray*: Commercial static sprays smell gross and are chocked full of weird chemicals. Making your own essential oil static spray is a game changer! All you have to do is fill a spray bottle with witch hazel (16-24 fl oz is a good size), and equal parts rosehip oil and eucalyptus oil (about 10 drops each.) Mist your clothing to get rid of that pesky static cling while also adding a long-lasting clean fresh scent. This particular DIY eucalyptus oil spray is also a great way to freshen coats and jackets in between dry cleaning. *Always test any laundry care product on an inconspicuous part of the garment such as a seam or hem. Do not use on leather. Is Eucalyptus Oil Safe for Dogs & Cats? The answer is NO. Even though we treat our pets like family, it’s important to remember that they are not humans and physiologically are very different from us. While eucalyptus essential oil has many benefits for humans, it can be extremely dangerous for animals. Second, even though some pet products may advertise using eucalyptus oil for fleas, these products are very carefully formulated to contain only extremely small amounts of eucalyptus oil. Mixing your own eucalyptus essential oil flea treatment could seriously harm your pet even if your ratios are only a little bit off. Bottom line: using eucalyptus oil for fleas should be left to the professionals. Do not use eucalyptus oil on your pets. Manyessential oils, including eucalyptus essential oil, are widely known to be a budget friendly antiseptic treatment. (14) With its antibacterial properties (15) and its clean fresh scent, eucalyptus oil has a variety of beauty, grooming, and wellness applications. Deodorizing: Nobody likes to smell, but many products that make us smell good contain harsh chemicals and synthetic ingredients that can cause us harm over time. Body odor is caused by the “interaction of your naturally-produced proteins with typically harmless bacteria on your skin.” (16) Reducing bacteria on the skin is one method widely used to deodorize the body. One way to avoid the odor and still be gentle on your skin is to add a few drops of eucalyptus essential oil to your favorite body wash. A high-quality essential oil body wash already formulated with eucalyptus essential oil is also a great option. Clear Skin: Finding a great skin care routine for your face can be especially tough. There are many acne treatments out there with harsh chemicals that can be damaging to sensitive skin types, or just not work at all. Understanding the causes of acne and using natural skin care products can help your skin look better while still being gentle on your face. Essential oil soaps or a face wash with eucalyptus essential oil are two great options. Scalp Cleanser: Dandruff from a dry itchy scalp is no fun. Over-the-counter dandruff shampoos may treat an itchy scalp, but can wreak havoc on your hair. Natural hair products with essential oils smell great and also leave your hair looking and feeling better. Adding a few drops of an essential oil blend with eucalyptus to your shampoo can help cleanse and soothe an itchy scalp. Doing the same with your favorite hydrating hair mask can also help hydrate both scalp and hair.